A handful of quotes to inspire you to fail and fail again because failure is an essential part of the creative process. It’s also a part of life. If we’re not failing, we’re just not trying hard enough. So go out there and fail better, fail faster. Rack up as many failures as you possibly can! I have missed more than 9,000 shots in my career. I have lost almost 300 games. On 26 occasions I have been entrusted to take the game-winning shot… and I missed. I have failed over and over and over again in my life. And that’s precisely why I succeed. To develop working ideas efficiently, I try to fail as fast as I can. Would you like me to give you a formula for success? It’s quite simple, really. Double your rate of failure. You are thinking of failure as the enemy of success. But it isn’t at all. You can be discouraged by failure—or you can learn from it. So go ahead and make mistakes. Make all you can. Because, remember, that’s where you will find success. An inventor is almost always failing. He tries and fails maybe a thousand times. If he succeeds once then he’s in. So try not to be too attached to any of the ideas you currently have. There’s no one here to take a picture of the two of us (Naima and me), but this is the chair in which I spend time each and every morning doing what I call sittin’ with the kitten. Naima isn’t really a kitten anymore at two years and nearly four months old, but she’s still quite kittenish and playful. I can’t recall how we got into this habit. There’s another white wicker chair in the living room next to the tallest cat tree, and that’s where we first started doing this. At some point we switched to my bedroom, which has a large window facing a grassy area and a bird-filled tree. I’m a creature of habit in the morning, and Naima has learned my habits well. She precedes me down the hall first to the bathroom and next to the closed door of my office. Then she waits while I get all my computer equipment turned on, open the blinds in the living and dining areas, and get the water heating for my coffee before I feed her. After she eats her breakfast, she plays with her toys while I finish fixing cereal or toasting an English Muffin. I eat breakfast in front of the computer (nasty habit). When Naima’s done playing, she comes and sits just inside or just outside my office waiting for me. I’d say waiting “patiently,” but it’s hard to ascribe patience to a cat. After I finish eating, I take the rest of my coffee back to my bedroom. Sometimes, Naima lags behind a little. If she’s not in the room when I sit down in the wicker chair, I say, “Where’s the kitty?” That’s her cue to peek around the corner and then come running over. She prefers to get up into my lap from the left side, so she might have to circle the chair before jumping up. Then she settles against my chest, with her head near my left shoulder, and we snuggle for a while. In page layout, illustration and sculpture, white space is often referred to as negative space. It is the portion of a page left unmarked: the space between graphics, margins, gutters, space between columns, space between lines of type or figures and objects drawn or depicted. The term arises from graphic design practice, where printing processes generally use white paper. White space should not be considered merely “blank” space — it is an important element of design which enables the objects in it to exist at all, the balance between positive (or non-white) and the use of negative spaces is key to aesthetic composition. When space is at a premium, such as some types of magazine, newspaper, and yellow pages advertising, white space is limited in order to get as much vital information on to the page as possible. A page crammed full of text or graphics with very little white space runs the risk of appearing busy, cluttered, and is typically difficult to read. I worked in the Retail Advertising Department of a newspaper for several years, which is where I became familiar with the term. Then a year or so ago, a newspaper copy editor blogged about the idea of incorporating white space into one’s day—to serve the same purpose as white space in an ad. Cramming the day with activity after activity with no time to just be leads to a cluttered mind, he suggested. It’s hard to take a deep breath when we’re always focused on or engaged in something, always trying to complete a task, converse with someone, or solve a problem. I agree. There’s almost no white space in my day–except for the time I spend sittin’ with the kitten. Naima atop her perch. Be Here Now. After Naima has had enough cuddling, she moves over to the cat tree, gives herself a bath, and then arranges herself on one level or another to watch what’s going on outside. I finish my coffee. And look out the window. And talk to her a little (her tail swishes in response). I’ve thought of bringing a book in there to read once she gets off my lap. Or a notepad to jot down the list of things I need to do or whatever random ideas may occur to me. You know–do something useful. But no. Then it wouldn’t be white space, anymore. At the end of the tutoring year, I created a card for him using a photo of Naima looking very sternly and intently into the camera. I added the caption Naima says: Angel, BE HERE NOW, which he got quite a kick out of. I wonder what his parents made of it. The fact is I’ve gotten some of my best ideas sitting in that wicker chair in the morning without really trying to have them. So I don’t let anything intrude into this white space. It’s one of the most important parts of my day. I’m sure Naima would agree. Once upon a time, in a life far far away, I came upon the instructions for an activity called creative doodling. Before describing it, though, I have to confess to a tendency I may have been born with to absorb activities like this one and then immediately turn around and teach them to any person or group halfway willing to give them a try. I used to say about myself that I was born to disseminate information. But the complete truth is that I was also born to show you how to do this stuff–whether you want to do it or not. Well, I haven’t actually hogtied anyone yet. That would be kind of counterproductive when it comes to creative doodling. Creative doodling is an art therapy exercise, but don’t let that put you off. It’s also fun. And so easy to do. Start with your dominant hand. Get out a couple of pieces of drawing paper (larger is better), masking tape, and some colored markers or crayons. Tape a piece of paper to a flat surface with masking tape to keep it from moving around. Choose a marker or crayon. Close your eyes and run your hand over the page to locate the edges. With your eyes still closed, start drawing on the page. 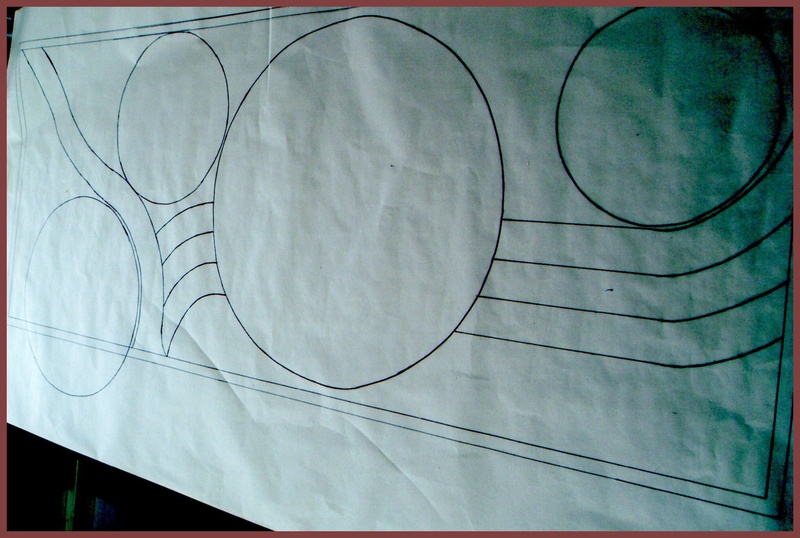 Don’t lift the marker off the paper; your drawing should be composed of one unbroken line. Don’t try to draw anything in particular. Just let your hand (and marker) wander all over the page until you feel like you’re done. Open your eyes and check out your work. Look at it this way and that (sideways, upside down) until you find an image in it. The image can take up most of your drawing or only a portion of it. It can be fairly complete or only hinted at. Once you’ve found your image, use the rest of your markers to elaborate it. When you’re done, title your drawing. These are examples of two of my creative doodles, the first with my right hand and the second with my left hand. I include them to demonstrate that NO artistic talent whatsoever is required for this activity. I love color and I enjoy coloring, so sometimes I do this just for fun. But it’s an activity that can also provide a little personal insight if you take the extra step and either journal about the pictures or at least tell yourself their stories. 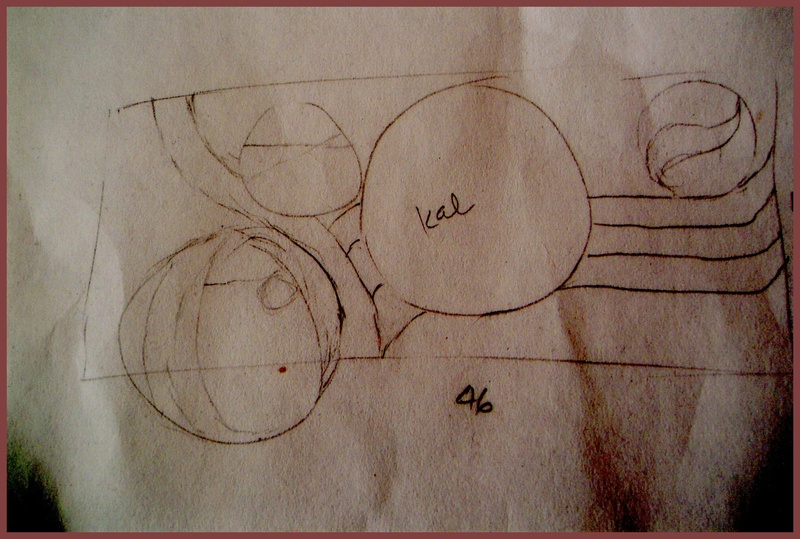 Another thing to do is write down the first five or six words that come to mind when you look at a finished drawing. This doodle, Bird’s Eye View, is one of my favorites. My doodles tend to include a lot of critters, among them a one-eyed flying fish and a rather demented frog. That’s just what I see. So now you know. 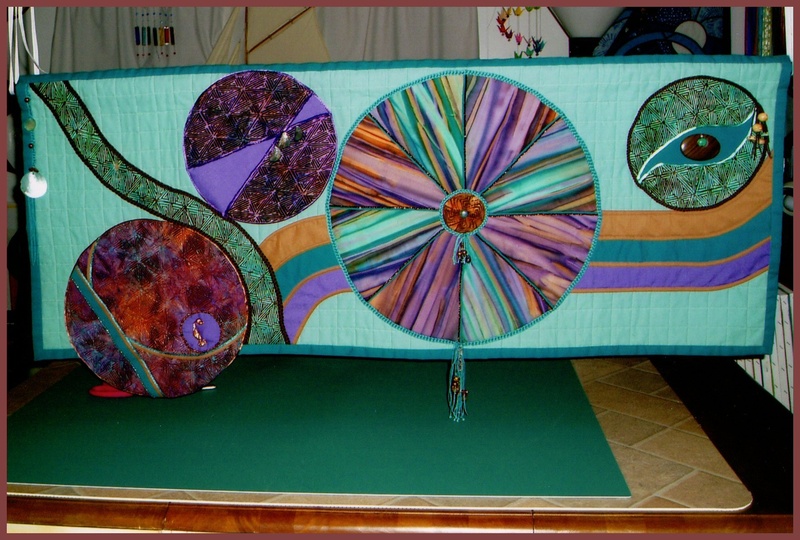 This is a guest post by my friend Sylvia Davis, a very creative quilt artist. She graciously agreed to undertake making something to hang on a wall in my living room. I love the resulting piece. A group of friends was at my house for dinner, and as often happens, we all gravitated to my workroom to discuss my current quilting projects. Silent amongst them stood Joycelyn, who was looking thoughtfully at each of the wall hangings in the room. 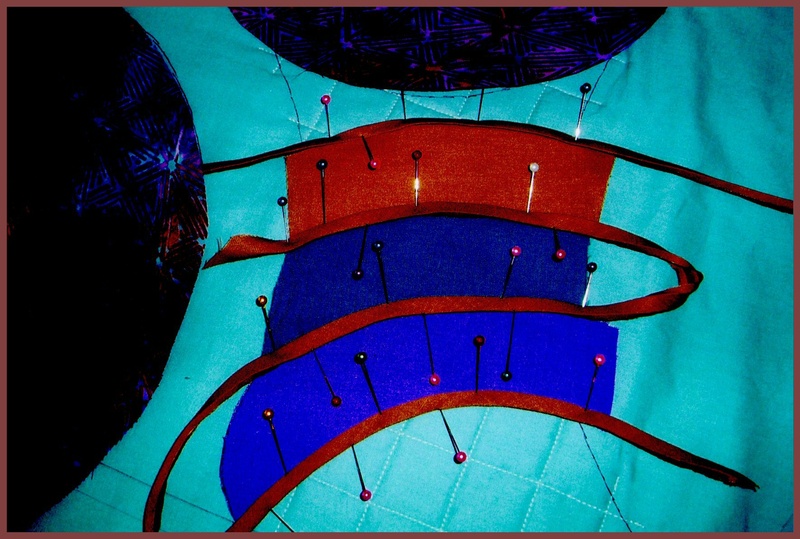 These were predominantly modern abstract stained glass-like patterns in bright colors using bias tape and sometimes beading. 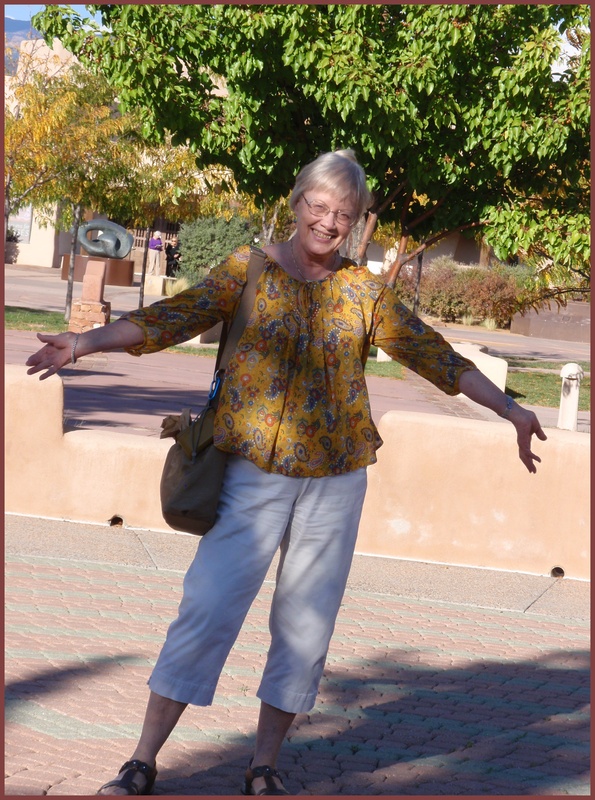 They had been created over many years sans any formal training other than an occasional quilting class and around working full time and raising teenagers; they were just for fun. Later she asked if I could make one like these for her, as she had a space in her living room that called out for something interesting. And with that, our collaborative adventure began. …and set off for the quilting shops for fabric. Two stores later, voila! 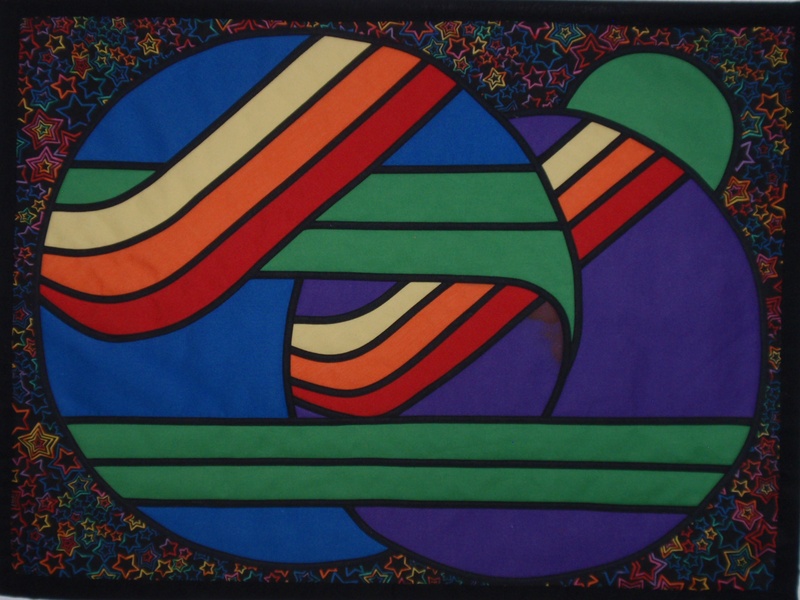 We found a Southwest abstract in several color schemes. There we sat on the floor of a fortunately empty store, bolts all around us and two store cats wending their way in between us, and we made our decisions. 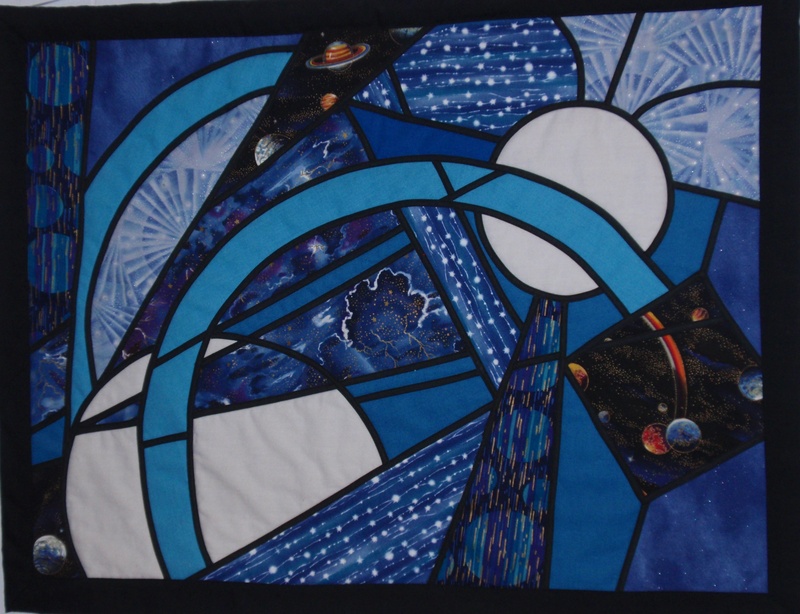 As I drove home after our purchase, I was utterly amazed that in one short afternoon we had both designed the wall hanging and bought the fabric! I had expected a much more laborious process. Our success lay in Joycelyn’s innate design sense, which meant that, even without the element of color, she knew immediately what she liked and didn’t like. Combined with my experience in which details would likely work and which presented too many problems or conflicted with the overall design, we had made short work of the whole designing process. 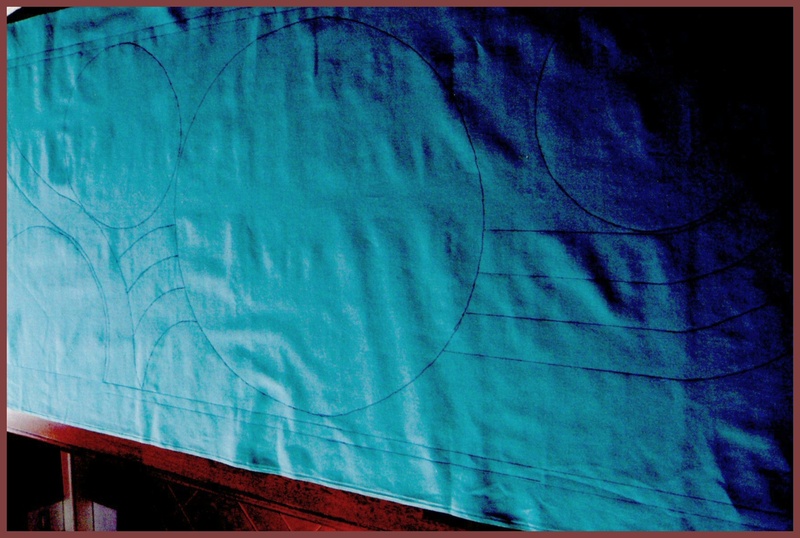 …placement and sewing of the curving lines, and assembly and attachment of the circles without a hitch. I couldn’t find the right color of cording for some of the circles, but found crocheting thread and braided it into two sizes, and we both liked the texture the braiding added and the tie-off of the threads that created some draped detail. When the wall hanging was nearly complete, we met in a gemstone shop to choose the final embellishments. 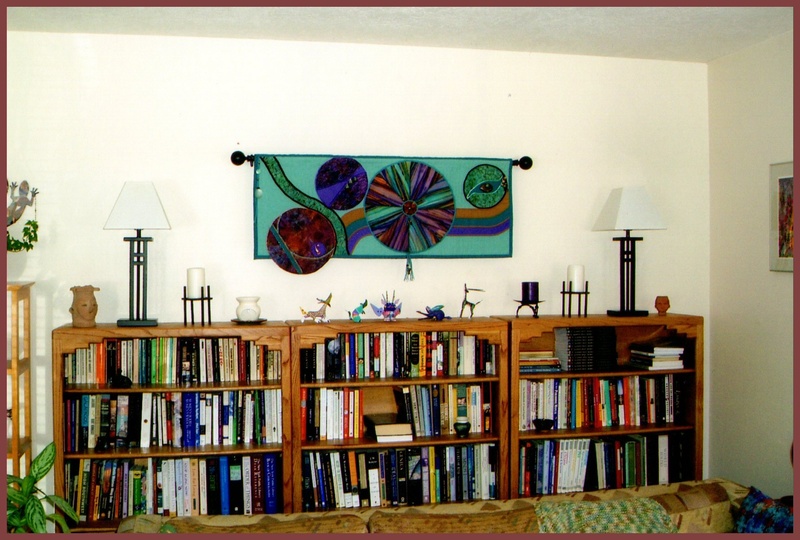 Then, only two months later, her new wall hanging was proudly in place, a bold statement that pulls many elements of her living room together satisfyingly. NOTE: I couldn’t agree more. Collaborating with Sylvia was great fun, and after just over six months, I can’t imagine not having this piece hanging on the wall of my living room. It just seems to belong there. Thank you, Sylvia! Looking forward to our next project together. 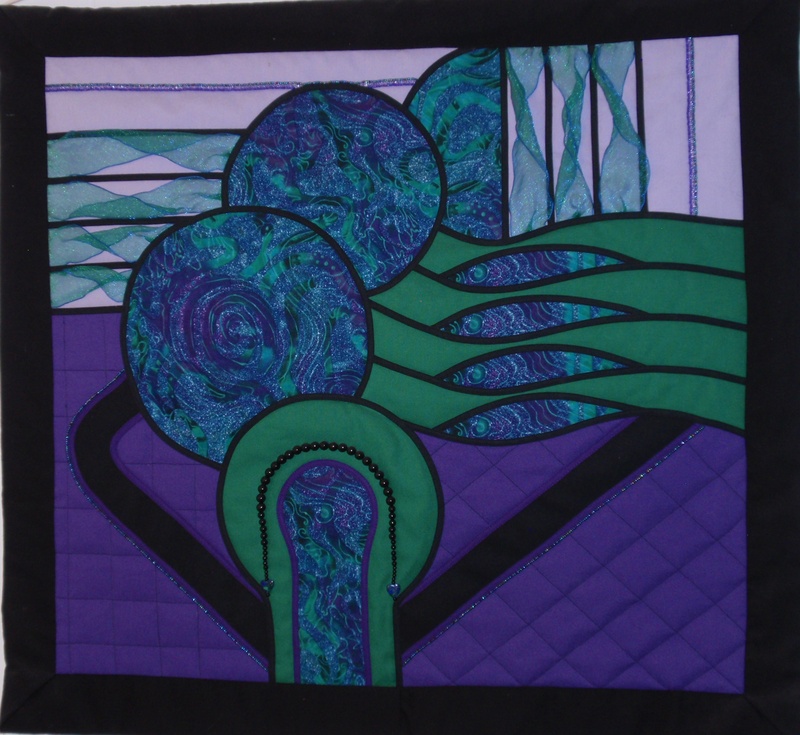 These are a few of the quilted wall hangings created by my friend Sylvia. 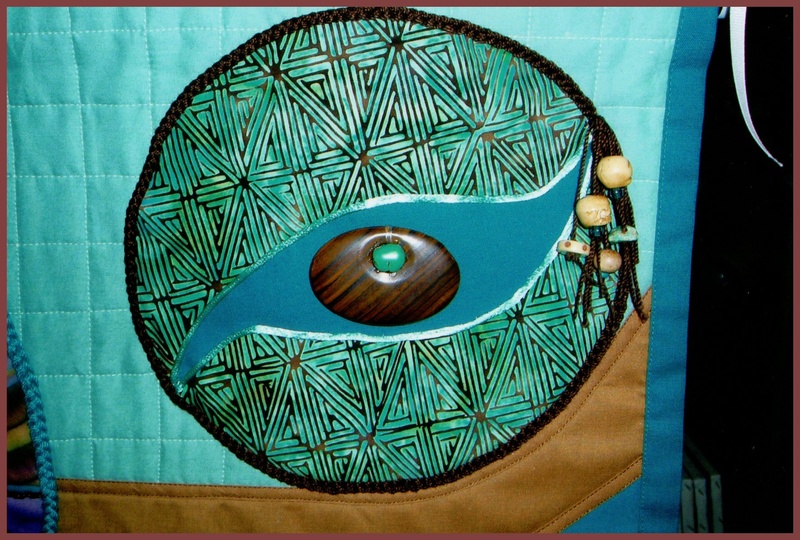 She bases many of them on designs from Dover books she’s collected over the years, adding whatever embellishments come to mind in the moment–beads, sequins, ribbon, shells, etc. I really admire her color and design choices. The two of us collaborated on the design of a piece to hang over the bookcases in my living room. After we chose the fabric, she then did an amazing job of putting everything together. But I’ll let her tell that story–with pictures–in another post. 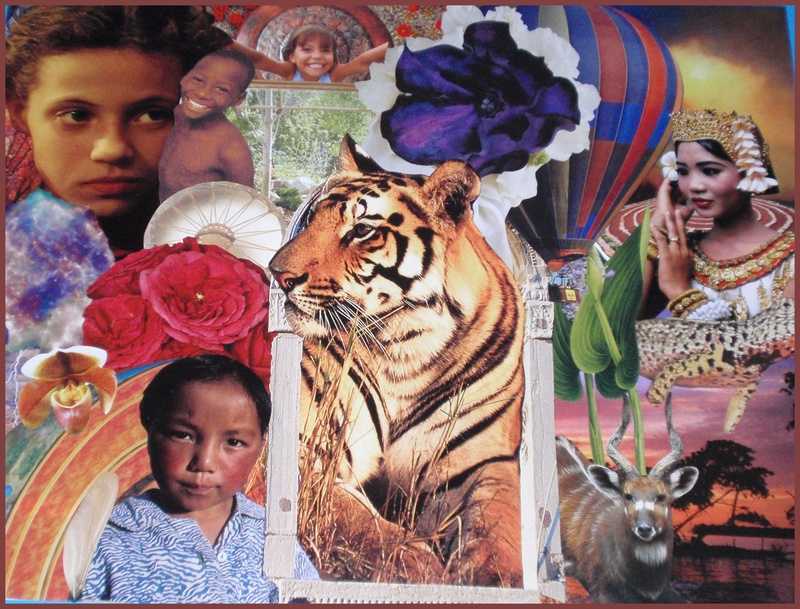 Collage is a great way to create visual art if you’re like me and don’t consider yourself to be especially artistic. All you need are a stack of magazines, a pair of scissors, a glue stick, a piece of cardboard or poster board, and your imagination. Knit and purl a few rows of that sweater. Borrow a coloring book from a kid and pick out a page to color. If you don’t have crayons, you can use some of mine. Take a photograph of something outside your front door that looks like autumn. Make up your own song—and sing it, of course. Draw a picture on a postcard and mail it to yourself. Tie dye your kitchen curtains. Choose a color scheme for redecorating your bathroom. 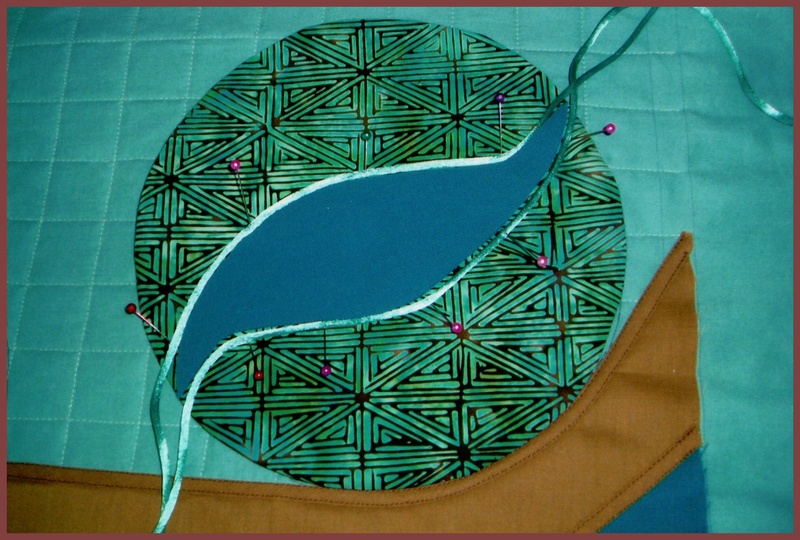 Cut out some pieces of fabric for your quilt. Turn a bunch of flowers into a bouquet. Build a shelf and paint it. 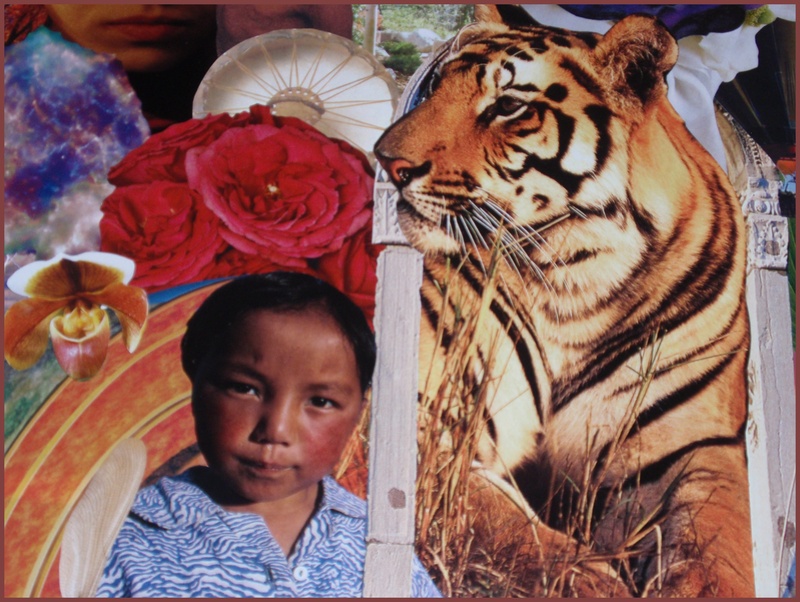 Cut out some magazine pictures and make a collage. Try a new recipe or experiment with an old one. Create your own list of things to create. Improvise. Riff. Make something up. 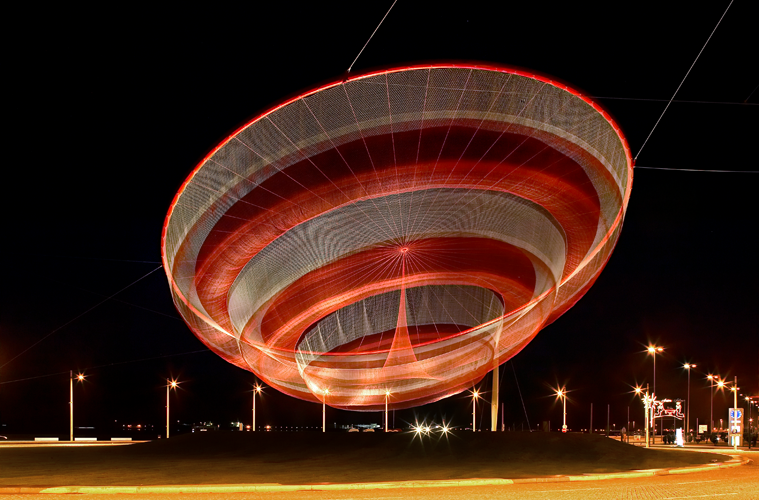 Janet Echelman spent seven years as an Artist-in-Residence at Harvard. She left Harvard to go to India on a Fulbright lectureship with the intention of giving painting exhibitions around the country. Although she arrived in Mahabalipuram, a fishing village in India, her paints did not. Without her paints, she needed to find another medium. First she tried working with bronze casters, but that was expensive and unwieldy. Then one night, she notice the fishnet the fishermen were bundling on the beaches, and that sparked her imagination. She wondered “if nets could be a new approach to sculpture: a way to create volumetric form without heavy, solid material.” The works she’s created are ethereal and stunning, unlike anything I’ve seen before. I really want one! but what if her paints HAD shown up? Echelman was probably dismayed, to say the least, that her paints hadn’t made it to India. But she didn’t give up and go home. It didn’t stop her from doing what she’d come to India to do. She took the materials at hand and used them in a way they’d never been used before. Although she didn’t have her paints, she still had her imagination and her creative spirit. Things hadn’t gone according to her plan. And it was a very good thing they didn’t because if they had, we wouldn’t have these gorgeous lacy sculptures to look at. It’s important to have a plan. But it’s equally important to not be so committed to the specifics of the plan that when things begin to fall apart, you fall apart, too. Change. Adapt. Be flexible. Look around you. Create from what’s already there. More views of the piece She Changes (above) can be seen on Echelman’s website, which also describes the materials used in this and other sculptures and their method of construction. It’s more than sad and disappointing that so many elementary and secondary schools are decreasing art programs or cutting them out altogether. It’s a cost-saving measure that hurts not only the students, but also society in general. Arts–and creativity–are not add-ons or extras. They aren’t really dispensable. Humans have been making art, in the form of painting, drawing, and carving, as well as music, since at least 20,000 BC–possibly even since 40,000 BC. Maybe it was engaging in those creative pursuits that contributed to our increased brain size and our unique capacity for learning and transforming the world we found ourselves in. How ironic is it then to get to this point only to collectively turn our backs on art? Artistic creativity is a neurologic product that can be examined using rigorous scientific methods. So he used fMRI (functional magnetic resonance imaging) on some jazz and rap musicians. Watch and listen to see what he found out. Arts & the Mind explores the vital role the arts play in human development throughout our lifetimes. Episode One, “Creativity,” features stories and the latest scientific research from experts around the country illuminating how the arts are critical in developing healthy young minds and maintaining them as we age. Showcases innovative arts education programs OrchKids in Baltimore and Get Lit in Los Angeles. This episode illuminates how art is the brain’s lifeline to empathy, emotion, mental agility and healing. Features stories and experts’ insights on: the positive effects of the arts for: children in hospitals; veterans suffering from Post-Traumatic Stress Disorder; building community in Appalachia; and warding off dementia. Science has to catch up to art.